The bar-tailed godwit (Limosa lapponica) belongs to the family of snipes and godwits, the Scolopacidae. The bar-tailed godwit species is distributed in northern Europe and Asia, western Alaska, Africa, Persian Gulf, India, southeast Asia, China and Australia. These godwit species breed in the Arctic region. These godwits are polytypic species. The bar-tailed godwit (Limosa lapponica) is a medium-sized godwit, measuring 35 to 40 cm in length. The males weigh 200 to 400 grams and the females weigh 260 to 630 grams. The wingspan is 70 to 80 cm. The female is larger, paler and has longer bill. In breeding plumage, the neck, breast and belly are brick red. In non-breeding plumage the bar-tailed godwit appear pale creamy brown with heavy mottling on the back and the wings. The whitish lower rump and the uppertail have dark barring. The long bill is slightly upturned. The bill is characterized by a dark tip and pinkish base. The irises are dark brown. The legs are bluish gray. The godwit call is a continuous "chip.. chip.. chipp" sound. The bar-tailed godwit species is distributed in northernmost Asia, western Alaska, northernmost Europe, western Europe, Africa, Arabian peninsula, Persian Gulf, Indian subcontinent, southeast Asia, China, Australia, New Zealand and Papua New Guinea. In India, wintering bar-tailed godwit species are distributed in the states of Gujarat, Maharashtra, Karnataka, Goa, Kerala, Tamil Nadu, Andhra Pradesh, Odisha, West Bengal, Tripura and Andaman and Nicobar Islands. The bar-tailed godwit nominate subspecies is distributed in Scandinavian Peninsula, Finland, Karelia, Kola Peninsula and west Yamal (Russia). It winters in North Sea, west Iberia and west coast of Africa. The bar-tailed godwit subspecies L. l. anadyrensis breeds in east Siberia and winters in Australia and New Zealand. The subspecies L. l. baueri breeds in northeast Siberia and northwest Alaska. It winters in China, southeast Asia, Australia and New Zealand. The bar-tailed godwit subspecies L. l. menzbieri breeds in north Siberia and winters in southeast Asia and northwest Australia. The subspecies L. l. taymyrensis breeds in northwest Siberia and winters in Africa, Persian Gulf and India. 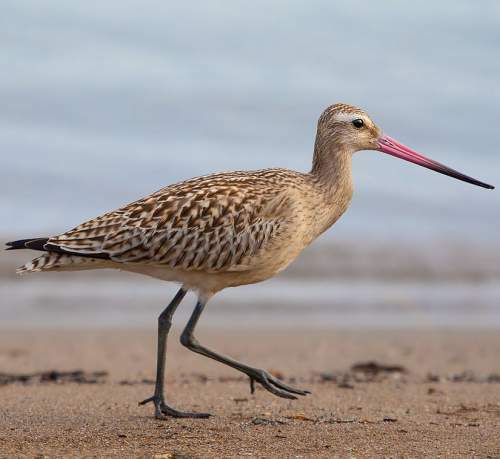 The Important Bird and Biodiversity Areas (IBA) of the bar-tailed godwit species in Australia are, Eighty Mile Beach, Roebuck Bay, Great Sandy Strait, Moreton Bay and Pumicestone Passage. The IBA of the bar-tailed godwit species in Russia are, Seskar island, Valley of headwaters of the river Schuchya, Basins of the Schuchya and Khadytayakha rivers, Malakchan bay, Moroshechnaya River, Ola lagoon, Perevolochny bay and Rekinninskaya bay. Some of the IBA of the bar-tailed godwit species in United Kingdom are, Chichester and Langstone Harbours, West Coast of Benbecula, The Wash, The Swale, Morecambe Bay, Mid-Essex Coast, Lindisfarne, Humber Estuary, Firth of tay, Hamford Water and North Norfolk Coast. The IBA of the bar-tailed godwit species in Norway are, Varanger Peninsula, Altaelvmunningen, Reisa, Inner Porsangerfjord, Øvre Anárjohka and Neiden- & Munkefjord. The IBA of these godwits in USA are, Egegik Bay and Nelson Lagoon-Mud Bay. These bar-tailed godwit species do not normally occur in forest. They normally occur in altitudes from 0 to 440 meters. The natural ecosystems and habitats of these bar-tailed godwit species include, tundra grasslands, tundra shrublands, wet river vallies, coastal marine lakes, freshwater lakes, intertidal mud flats, marshes, coral reefs, estuaries and freshwater lakes. The diet of the bar-tailed godwit consists mainly of invertebrates. Molluscs, crustaceans, polychaete worms, insects and insect larvae, spiders and earthworms are their primary food. The bar-tailed godwit also feed on tadpoles, small fish, fruits, seeds, leaves and other plant matter. These godwits forage near the edge of water or in shallow water by probing the mud with their long sensitive bill. The breeding season of these bar-tailed godwit species is from May to July in the Arctic summer of most of their breeding range. They are monogamous. Some females exhibit polyandrous behavior. The bar-tailed godwit nesting sites are located in inland Arctic habitats, including dry positions in shrub tundra, montane tundra and hummocks. The nests are usually shallow scrapes in the ground, lined with lichen or plant material. The clutch usually consists of two to five eggs. Both of the bar-tailed godwit parents take turns to incubate eggs. The chicks hatch out after 20-21 days of incubation. These bar-tailed godwit species are migratory birds, breeding in northernmost Asia, Europe and Alaska and flying south for wintering. The bar-tailed godwits leave the breeding grounds in Siberia and Alaska in mid-July onwards for wintering. The return migration commences in March and the godwits reach their breeding grounds in May. Several birds may stay back in their wintering range. The global population size of the bar-tailed godwit (Limosa lapponica) is estimated to number 1,099,000 to 1,149,000 individual birds. The overall population trend of the species is considered to be decreasing. In most of its range, this godwit species is reported to be rare and locally uncommon. The generation length is 8.9 years. Its distribution size is about 9,050,000 sq.km. Habitat alteration and destruction, pollution, hunting, disturbance from human activities, climate change and severe weather are the main threats that are endangering the survival of this godwit species. The bar-tailed godwit (Limosa lapponica) is approaching the thresholds for being Vulnerable under the range size criterion, under the population trend criterion and under the population size criterion. The IUCN (International Union for Conservation of Nature) has categorized and evaluated the godwit species and has listed it as "Near Threatened". 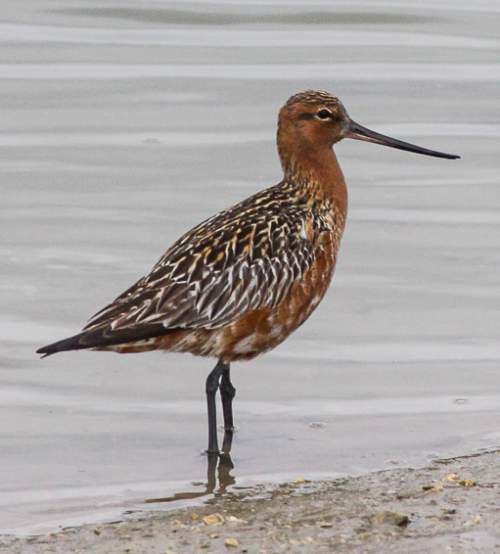 The CITES (Convention on International Trade in Endangered Species of Wild Fauna and Flora) status is ‘Not Evaluated’ for bar-tailed godwit (Limosa lapponica). The five recognized subspecies of the bar-tailed godwit (Limosa lapponica) are: L. l. lapponica (Linnaeus, 1758), L. l. taymyrensis Engelmoer & Roselaar, 1998, L. l. anadyrensis Engelmoer & Roselaar, 1998, L. l. menzbieri Portenko, 1936 and L. l. baueri J. F. Naumann, 1836. Current topic in Birds of India: Bar-tailed godwit - Limosa lapponica.